Not all of us are natural born conversationalists. You know the type: She can work a room and charm her way to a brand new opportunity. If that sounds like you, consider yourself lucky! For the rest of us, it can be really uncomfortable to build rapport with a stranger without running into awkwardly long pauses, immediately followed by a quick getaway. “Excuse me, I need to use the restroom!” Who hasn’t used that one? It’d be a lot easier if it was an innate skill, but here’s the good news: Conversation is a skill that we can hone just like any other soft skill. 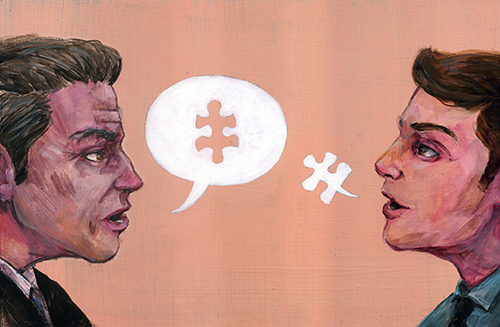 We spoke to many successful folks whose job depends on having great communication skills, and we asked them about the habits of amazing conversationalists. “If we truly want to understand the person we are with, our talk-listen ratio should be 1:10,” according to Jack Springman on Harvard Business Review. If you make it a goal to try and get the other person to talk 90 percent of the time, you’ll be better off than most people who “listen with the blatant, obvious intent to talk,” says Brian Braudis, president of The Braudis Group Consultants. Don’t be that guy who’s just waiting for his turn to speak. Eagerly injecting a word whenever possible. Or worse, interrupting. Ten out of 10 communication experts agree that to be a great conversationalist, the most important thing you can do is listen, think and respond in a way that shows you’re truly listening. A great, simple way to build rapport is to reference something she mentioned before. “Hey, I tried that sushi place you mentioned and it was amazing!” Boom. She’ll not only know that you listened but also respect her opinion. It’s the little things that earn trust and boost conversational IQ! Communications experts can’t emphasize this point enough: “We find others to be interesting when they are interested in us,” says Patrick Malone, senior partner of The PAR Group. So if you want to be an interesting person, be interested in her. Great conversationalists want to make others feel good about themselves during the conversation. “If you make someone genuinely feel good, you’re one step closer to making an ally,” says Bob Burg, author of Adversaries into Allies. Even if you come across someone who you think is totally wrong (the Lakers are no longer the best LA team, sorry Kobe! ), it’s crucial to respect their opinion. “This doesn’t mean we necessarily agree but no one likes to be told their opinion is wrong,” Malone says. It’s always better not to be too argumentative in a great conversation. The way you present yourself while chatting can convey a lot more than you might assume. For instance, “the general consensus is that tensely folded arms mean you are closed to what someone is telling you, while if you like what you hear, you’ll likely adopt an open posture, and even lean forward a little,” Psychology Today reports. Standing too far away can signal discomfort. Lack of eye contact can have the same effect. Touching your hair too much is a dead giveaway that you’re nervous. If you simply focus on making good eye contact (without being creepy) and mirror their body language, you’ll have a stronger connection. This way, when you converse, you can dig into something you’ve read about and add cool, new info to the conversation. “Pick an issue and then read five articles about the issue from five different countries,” Langerud says for a totally holistic perspective. This can help you relate to brand new people from all walks of life.